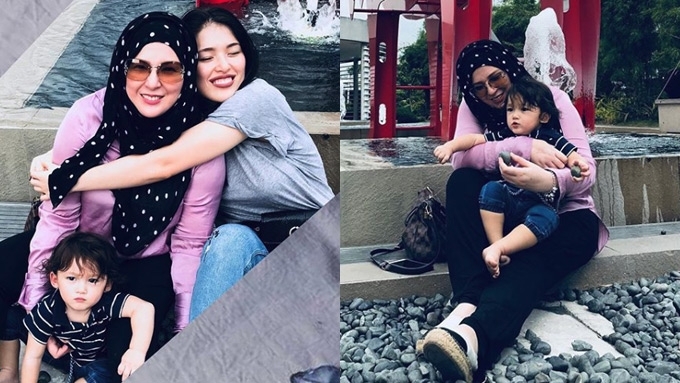 Kylie Padilla, son Alas, and mom Liezl Sicangco spend some quality time together. On Instagram, the Kapuso star writes, "Seeing her with Alas is like feeling safe." Kylie Padilla says a mother's love is incomparable. The 25-year-old actress finally gets to introduce her one-year-old son Alas Joaquin to her mother Liezl Sicangco in person. Kylie's mom, who is based in Australia, is currently in town. The Kapuso star's Instagram post clearly shows her happiness seeing her mom Liezl play with Alas. Her caption: "These are the best." How much does Kylie miss her mom? Let her big hug show you. Her post reads: "I don’t take for granted how lucky I am to still have my mom with me. "Seeing her with Alas is like feeling safe. "Love you ma [wilted flower emoji] thank you for today... #amotherslove #amothersloveisforever "
With Liezl in town, Kylie wants to take advantage of the fact that her mom is a good cook. She writes, "Ang next mission ko, dapat magpaturo akong magluto sakanya dahil napakasarap magluto ng nanay ko. Walang biro. Para ready na talaga for another milestone in my adult life. Lol." Back when Kylie first learned that she was pregnant, the first person who knew about it was Liezl. In an exclusive interview with PEP.ph (Philippine Entertainment Portal), Kylie recounted their phone conversation. She said, "The day na nag-pregnancy test ako, that day mismo, I had taping, tapos tumawag ako sa nanay ko. “Sabi ko, ‘Ma...’ wala pa akong sinasabi, naiyak na ako. “Siyempre, alam naman ni Mama sa showbiz, e.